SACRAMENTO - Even though the Kings easily demolished the visiting Los Angeles Lakers, 113-96, Thursday night at the Power Balance Pavilion here in West Sacramento, there wasn't much urge among loyal fans to jump up and down and celebrate. The Kings' season, after all, ended disappointingly with 22 victories and 44 defeats. And unlike the Lakers who are playoffs-bound and on track for their annual championship pursuit, the lowly Kings are headed to the lottery for the sixth consecutive year. And if Sacramento were to get better than 22-44 next season, the work must begin on defense, where the Kings are dead-last in the NBA, giving up 104.4 points per game. Sacramento is also dead last in field goal percentage defense, allowing the opposition to shoot 47.6 percent from the field. But there is hope. The Kings have a young core of guys to build upon. And with a little tweaking through trades, draft picks and free agency, maybe this once great franchise can recreate some old magic weaved years back by Mike Bibby, Chris Webber, Vlade Divac, Doug Christie, Peja Stojakovic, et al. At 6-foot-10, 270 pounds, DeMarcus Cousins has blossomed into a fine power forward. The 21-year old is holding his own against the league's big men, averaging 18.1 points and 11 rebounds per game. 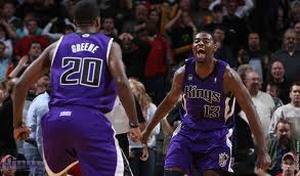 Tyreke Evans is evolving into a versatile guard, scoring 16.5 points per game alongside 4.6 rebounds and 4.5 assists. The 6-foot-6, 220-pound is just 22 years young. Point guard Isaiah Thomas, 23, has provided one of the few highlights of the King's frustraitng 2011-12 campaign. The smallish sentinel, just 5-foot-9 and 185-pounds, razzled and dazzled hs way to 11.5 points and 4.1 assists per game. Yet another guard, Marcus Thornton, also holds so much promise. The 6-foot-4, 205-pounder is norming a team high 18.7 points per outing for the Kings.